Not long after I started a gig as a weed trimmer in Humboldt County 10 years ago, I got an education in why “Humboldt Green” — a popular euphemism for the region’s most famous crop and economic lifeblood — is often a complete misnomer. Clipping leaves off the hang-dried plants on a hot summer day, I was stunned to find that beneath the white resin crystals, amongst the tightly-curled orange hairs, this marijuana was somehow, miraculously, a deep aubergine. “Does it really grow that way?” I asked my friends. They laughed at my naïveté and packed me a thick purple ice bong of what was known to them — and eventually everyone else — as Grand Daddy Purple. Though the strain, a hybrid of Purple Urkle and Big Bud, is only 13 years old, it’s quickly become became a mainstay for producers and consumers alike. Growers love that the small, space-efficient plants reliably produce a high-yield crop. Smokers love the muscle-relaxing, pain-relieving high. Rare is the California weed club that doesn’t carry a ready supply of the fat, dense, purple buds, though they don’t always spell it correctly. It’s nobody’s grandfather, as the common misspelling Granddaddy Purple would suggest. Rather, Grand Daddy Purple is the grandest father of all, the king of purples and indicas alike. Part of that grandness is the density of the smallish buds. The half-bud I ground up last week yielded more weed than I could fit in a large cone, much less smoke in one sitting. When you pull apart the dried herb, the smell is heady and tempting and nearly impossible to resist. The taste of the bud is mildly sweet, like other purples, without a hint of sharpness or citrus. The primary characteristic is a woodiness that brings to mind moonlit nights in the redwood forests behind my childhood home in rural Northern California. There, the stars are unbelievably bright, and we would tromp into the woods and lie back on the damp earth and laugh and share secrets, dark and silly, and smoke and stare at the glittering sky until our bodies tingled with the drugs and the cold and it felt like we were dancing together across the Milky Way. The taste of the smoke on my tongue is always decidedly dark and slow, a winter strain. It’s the bourbon of pot strains, and man, do I love a good bourbon. My favorite time to smoke GDP is at night, after a long meal, to slow the brain and sink easily into a much-needed snooze. I started having anxiety and sleep problems when I was 19; every night became a struggle to turn off my thoughts and irrational worries. However, I was loath to become reliant on traditional pharmaceuticals at such a young age. My first script for medicinal marijuana was written by hand on a normal prescription pad by the doctor I’d seen since childhood. It made sense for her and for me; instead of taking Ambien or Xanax, I’d try to ease my symptoms naturally. 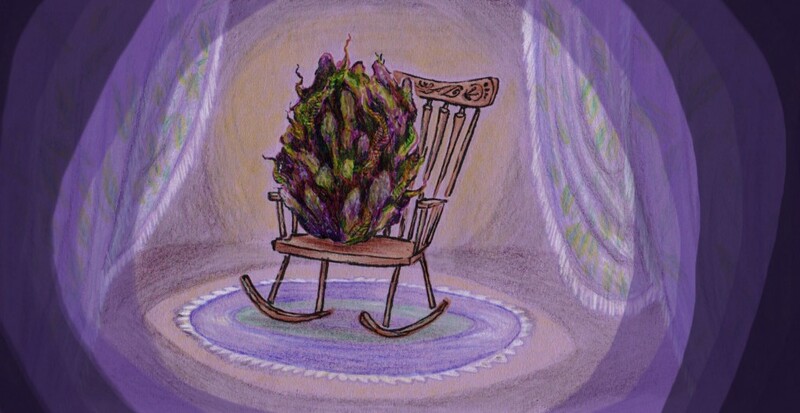 All indicas will help with sleep disorders, but smoking GDP gives me a particularly languid high, ideal for kicking back, snuggling up in an easy chair and taking my mind off of the day’s worries and responsibilities while I marathon old episodes of SVU. These days, I’ve left Humboldt and I smoke much less Grand Daddy Purple than I used to. My insomnia is mostly under control, and I have a prescription for Ativan for the rare moments I get a panic attack. But, as with my hometown, sometimes I just need to go back for a visit. When I’ve got Grand Daddy Purple at hand, I know that I’ll be drifting off to sleep with a calm mind and into a sky full of bright, familiar stars — and that sweet certainty will always keep me coming back. Eloise LeBel is a writer in Los Angeles. She reviews pot edibles for MEL.